Just seven hands into heads-up play, the thirteen-plus hour final table crowned a champion in Jamie Gold and a runner-up in Paul Wasicka. Gold was at or near the chip lead ever since day 3 and sported a huge chip lead of over 7:1 on runner-up Paul Wasicka when heads-up play began. The monumental hand came after Gold raised to $1.7 million preflop and Wasicka called. The flop came Qc-8h-5h, and after Gold checked, Wasicka bet out $1.5 million. Gold moved all-in, and Wasicka hesitated for a moment while Gold tried to goad him into a call. Wasicka seemed to read Gold for weakness and made the call with two tens, while Gold showed Q-9 for top pair. 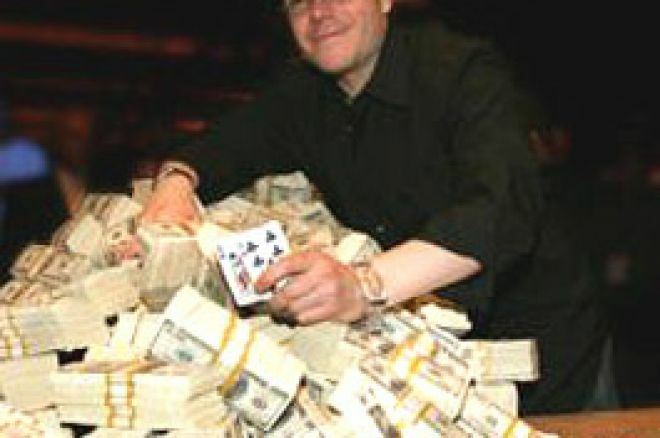 The turn came an ace, and the river a four, offering no help to Wasicka, and Jamie Gold was the new World Champion. On the critical hand, Wasicka gave credit to Gold for using his table chatter to his advantage. Wasicka noted, "He did a really good job of tricking me on the last hand. He check-raised me all-in and made it look like he was on a draw, and at that point, I didn't feel like I could keep on laying down hand after hand. I felt like based on the previous half-hour, he was in the gambling mood, and he did a really good job of mixing it up. He said, 'Oh, you don't have a queen, do you?' Then he stood up, like a lot of players do when they're on a big draw. My gut told me just go for it, and my gut was wrong." It was a disappointing but not totally unexpected finish for Wasicka, who faced a monumental challenge going into headsup play against an incredibly aggressive opponent in Gold who had a huge chip lead to his advantage. Wasicka finished with $6,102,499 for 2nd, and warned that he would be a presence in the tournament scene for a while. After exiting, he told the press, "I am very confident in my deep-stack poker ability. If you look at my results, almost every tournament I've been in I've been chip leader at one point or another. I like seeing a lot of flops, and if you run through a cold streak in a 30 big blind tournament, you're short on chips whereas in a deep-stack, you can work through that." Gold expressed a similar bravado after winning, commenting, "I crushed every table I played at except the one with Daniel Negreanu – he's amazing, I couldn't beat him." Gold never seemed to have any self-doubt about his abilities, which he credited with helping him throughout the tournament. He reflected, "I've never played in the World Series before, but I believed that I could do it. I've won a lot of small tournaments but I wanted to see if I could compete with the best. Johnny Chan thought that I could, and I thought that I could too." Gold, who had represented a number of big stars in his career as a Hollywood agent, spoke of how he was dedicating his win to his father suffering from Lou Gehrig's disease. He played very powerful poker throughout the day and never really faced any significant road bumps in winning his first bracelet. With a mix of fortuitous cards and good big-stack play, Gold was able to take down the record $12 million first place prize. As for his chances of coming back next year to defend his title, Gold noted, "Unless I'm in a hospital somewhere, I'm going to be here. I can't wait to play again."